Last week, alarm over the death of a pedestrian at an intersection near her school of 500 students prompted Sue Groesbeck, the Head of Stratford Hall to go public about her concerns. She wants the area to be declared a school zone and some basic safety supports, including a 30km/hour speed limit, an illuminated cross-walk and traffic calming measures. Unfortunately, this issue plays out on the streets surrounding schools across the province. And there are health consequences as well as safety dangers when there’s too much traffic and our streets feel unsafe. These days, children and youth are far less likely to walk or ride a bike to school than in the past. 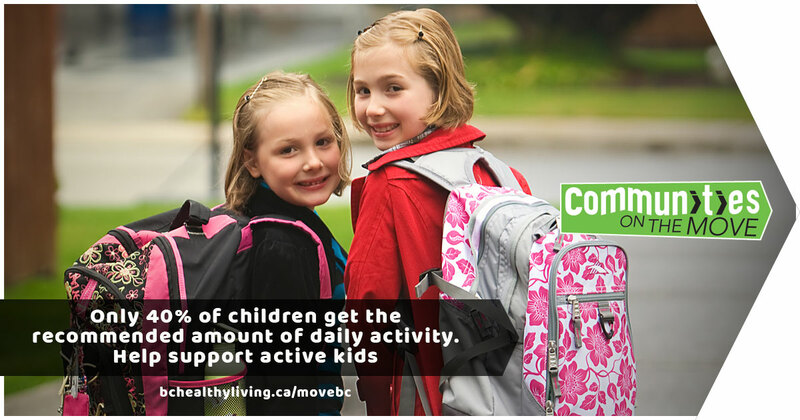 According to a 2016 report by ParticipACTION, only 26% of 11-15 year olds are walking and biking to get to school. Meanwhile in BC, the most recent statistics tell us that 40% of children aren’t meeting the recommended levels of daily physical activity. This is a problem today and it doesn’t bode well for the future health of this generation. Luckily we know what to do about this problem and there are some good supports. This week is ‘Walk and Wheel to School Week’ which is a fun, motivational event and part of a global movement, International Walk to School Month. This improves safety too. Studies have shown that with greater numbers of people walking and biking, comes greater visibility and car drivers become more aware. But parents are reluctant to allow their kids to bike or walk when the street doesn’t feel safe and that is where Active School Travel Planning and School Safety Zones can make a big difference. Organizations such as Active and Safe Routes to School and BC-based HASTe, the Hub for Active School Travel provide information and resources such as this on-line toolkit for School Travel Planning. The Communities on the Move Declaration calls for a more universal approach with a dedicated funding stream for Active School Travel Planning and standardized cycling education for children. It would be great to see BC adopting the School Safety Zones approach announced by Toronto’s Mayor, John Tory at the start of this school year. They are working on improving the safety around schools, starting with the ones that are statistically the most dangerous and working down the list until every school has traffic safety measures in place to protect children. “New safety elements for the designated schools include “watch your speed” driver feedback signs, flashing beacons on school zone signs, and school zone stencils on pavement, which will extend up to 250 metres away from the designated schools to encourage students to walk or bike to class. Sounds like a great start, doesn’t it?! If this is something you’d like to see at your local school, please add your name to the Communities on the Move Declaration. More importantly, please tell BC leaders that you want all schools to be active and safe! !